Hayao Miyazaki is one of the most influential and powerful forces cinema has seen in the last twenty years, helping define Japanese art and culture for much of the West. People all across America will instantly recognize Totoro, the massive cuddly cat-like character from the film “My Neighbor Totoro”. The character has become a part of American iconography, endearingly embraced by children around the world. Hell, you can find a Totoro plushy in many stores, and some of the younger kids in my family have a plushy Totoro as part of their stuffed animal collection. He even has a cameo in “Toy Story 3”. That is to say, he is a loved character in homes that are otherwise anime-free. The same can be said for the breakthrough film Spirited Away, which not only has been repeatedly played on Cartoon Network for years, but took home the first and only animated film Oscar for an anime. It is safe to say Miyazaki has shaped, very positively I think, the public perception on anime in a post-Pokemon world. There are many reasons for this, but one might be that he shares Steven Spielberg’s powerful sense of wonder, stirring up the same type of movie magic audiences felt with “E.T.” or “Jurassic Park”. In “My Neighbor Totoro”, there is a bus with fur lining the outside. It has a mouth, paws, and even a tail. It is a cat bus, and it smiles at the camera. Few filmmakers dare to imagine, and fewer still can execute that level of imagination with the same gusto as Miyazaki. His positivism is heartfelt and sincerely rendered, and that is projected onto the audience. They love him, and rightly so. For this reason, I have to confess he is one of my favorite filmmakers. So, it comes with a real sense of loss that he will no longer be making movies, and that his final film is the one currently being reviewed. It’s called “The Wind Rises”. What’s interesting about The Wind Rises is that it eschews the rulebook Miyazaki has built up with his long and incredible career. To start with, it’s a biopic, and a by-the-basics one at that. It could be called traditional. On the surface, this may seem drastically less interesting than an enormous flying castle bursting through the clouds or galloping mutant-sized wolves. And the plot synopsis might not convince you otherwise: Jiro Horikoshi is a young wide-eyed boy who wants to engineer airplanes and goes to schooling to learn how to do it. He’s also a compulsive optimist who might be a proxy for Hayao Miyazaki himself or who Miyazaki hopes to be. As Jiro’s life continues, he’s discovered as a prodigy and goes on to make some of the most important planes ever made just in time for World War II. On paper, this is the story about a boy who learns how to make planes and then makes them. The second half slowly builds into a war-torn romance right out of “Doctor Zhivago”, and this level of melodrama hasn’t been seen before in a Miyazaki film. As a historical drama set in the 1920s, it might seem as though a filmmaker long lauded for his unhindered imagination might come up short, at least in that department if no other. It’s with pleasure that “The Wind Rises” is amongst his most fully realized films on every level, and arguably his most personal. 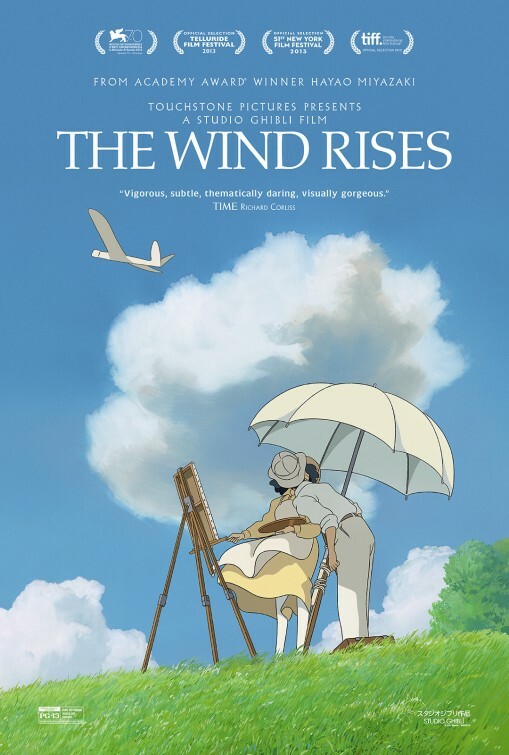 For starters, despite its historical real world setting, “The Wind Rises” ranks as one of Miyazaki’s dreamiest and most surreal films. This is an effect of planting the film firmly in reality rather than a dreamy wonderland like “Spirited Away” or a fantasy world like “Howl’s Moving Castle”. In those films, when viewers are shown the fantastic, it is merely the logical consequence of the premise. But when a setting in the natural world embellishes on reality, each flourish is deeply felt. For instance, most scenes don’t begin and nor do they end, instead existing only in the middle. Miyazaki throws the viewer smack dab in the middle of the action. There are necessary exceptions, but here’s one example: we cut to a painter just as her umbrella flies violently away rather than witnessing the assembly of the painting easel, the paints, and the canvas. The moment-to-moment effect is a severe one, where the film as a whole washes over the viewer with a Vertigo-like trance. Sure, there are dream-sequences clearly segued from reality, but the same visual cues from the dreams start to manifest in the woken world. Watching paper airplanes soar in impossible zigzags as they grow and shrink into the frame is a splendid, joy-filled experience. To reference Inception, it’s pure creation. There’s much said in the film about bringing your dreams into the real world. Obviously, there is the immediate meaning of the phrase: to transform the artistic impulse to create into the essence of the real world. Here, that is the airplane, and Miyazaki beautifully celebrates the act of creation. But, there’s a deeper meaning that floods through the film’s many channels. Many of them were just summarized above, but “The Wind Rises” has a more nefarious intention in its use of this device. Let me address this point with a single shot, but bear in mind this is one example of many. The German Secret Police hunt a fleeing man, and as they catch up with him, the image cuts to a high angle shot peering down at an alleyway. In a gut-punch of visual hyperbole, the shadows of the secret police, framed by a deeply saturated yellow light, suddenly take on contorted and deformed shapes, as though their twisted souls were laid bare on the concrete and stone. This is without a doubt Miyazaki’s most heart wrenching and despairing work, reveling in the dark as much as the light. This is also the right time to compliment the extraordinary visuals. I’ve always said Spirited Away might be his best executed film from an animation point of view, but The Wind Rises matches or exceeds it. Every frame explodes with life and movement, and how objects seemingly grow and shrink before the frame can be seen as an argument for the anime art form itself. No other form of moving image arts allows for as a meticulous construction of space as the anime. There’s a lot of Miyazaki in Jiro, and there’s an obvious comparison between Jiro’s planes and Miyazaki’s art. This wasn’t intended to be Miyazaki’s final film at the start of production, which means something about it conjured within him a compelling sense of closure on his career as a filmmaker. 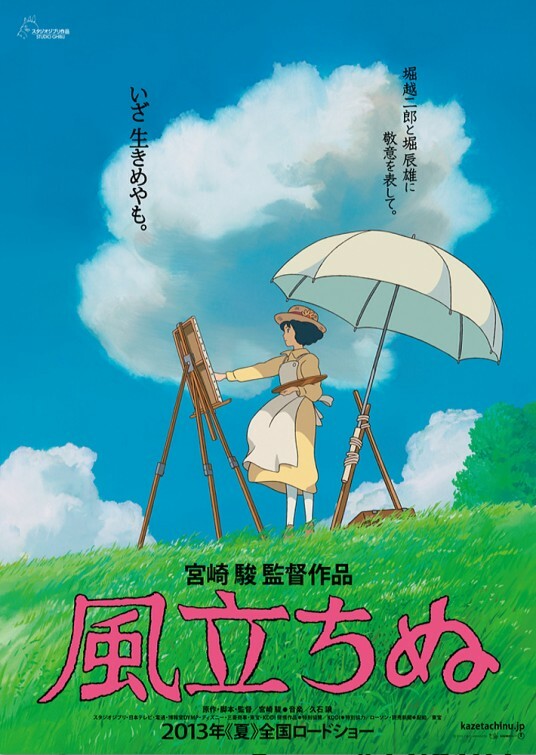 As far as I can extrapolate without having ever met or spoken to Miyazaki, it seems evident that “The Wind Rises” shows the youthful idealism he always showed in his previous movies finally confronting the bitter and harsh reality Miyazaki had spent a career trying to escape. “The Wind Rises” sees an open debate between Jiro’s majestic view of life and bitter truth of the situation—that his beautiful creations were used to horrific and destructive ends. Jiro is naive, and the film reflects that naivety. Some circles have criticized the film for its artistic portrayal of weapons of war, which can be interpreted as a contradiction in Miyazaki’s staunch pacifism. These claims, as they often tend to be, are without merit. They miss the point, and this issue is addressed openly in the film. You may notice I’ve left out more of the film’s “content” than I usually do in my reviews, but that is because so much of it is meaningless without seeing the soulful execution behind it. I leave that to you. I also have to mention I saw the film dubbed, and while the English speaking voice cast did a good job, none were of note enough to devote much time to their performances. It’s easy to see how “The Wind Rises” was Miyazaki’s way to work through the internal struggle he’s been working through on all his movies, and, in the film’s final moments that share equal part melancholy and splendor, he just may have resolved it.